I love watching quilt tutorials. This cutie also came from a Missouri Star Quilt tutorial. Jenny made individual blocks in a weave pattern, but I wanted to see what a whole quilt top would do. I didn't have enough fabric to go bigger, so I added two borders. 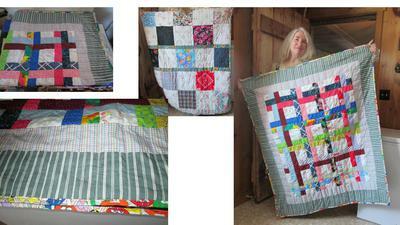 The quilt is 46" x 54" and is quilted using "stitch-in-the-ditch". The border is a bright M&M's print that draws the eyes right out to the edges. All of the fabric is scrap bits leftover from other projects. I always dread washing quilts, but my cat decided to force my hand on this one.